Laying emphasis on environment, health and education sectors, the Aam Aadmi Party government on Thursday presented a Rs 53,000 crore budget for 2018-19 fiscal, while making a slew of announcements, including a major thrust on “green” initiatives for pollution reduction and launching ‘health insurance for all scheme. The government also announced installation of CCTV cameras in schools, providing self-defence training for girl students, allocating Rs 100 crore for free Wi-Fi, which was a major pre-poll promise by the AAP and installation of 1.2 lakh CCTV cameras in the city by June next year. It also promised implementation of doorstep delivery of government services by June 15, and Rs 1,500 crore for infrastructure development in unauthorised colonies. This is the first “Green budget” of the government for effective containment of pollution in the city, the deputy chief minister said in the budget session of the assembly in the presence of Chief Minister Arvind Kejriwal. The chief minister congratulated Sisodia for presenting a “splendid budget”. “In the budget, government had taken care of all sections of society. There is a lot for poor people, women, middle class and students. It is a first of its kind Green Budget in the country. Besides education and health, we have focused on roads, sewer and water. We have also stressed on investment in these three areas,” Kejriwal said. Sisodia, who also holds the finance portfolio, said the budget follows “trickle up” economics aiming to benefit poor and middle class people in Delhi. “The budget estimates for 2018-19 are pegged at Rs 53,000 crore which is 19.45 per cent more than the revised budget estimates of Rs 44,370 crore for the previous financial year,” he said in his speech which lasted more than one-and-a-half hour. “We are going to thread 26 programmes and schemes of transport, power, environment and PWD for devising a unified system of pollution control, bringing down levels of different pollutants,” Sisodia said, adding the government has also proposed to set aside Rs 1,000 crore for repair and maintenance of smaller roads owned by the municipal corporations. The budget also put thrust on reducing pollution levels in the national capital by proposing various measures, including concession in registration of CNG cars. 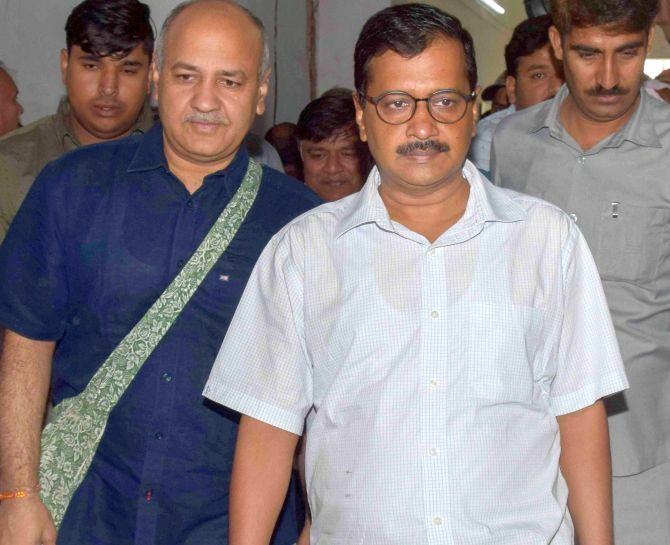 Presenting the budget estimates, Sisodia announced 50 per cent concession in registration of CNG cars and said solar panels will be installed over 16 km cycle track. As many as 1,000 indoor display boards will be installed in government buildings to provide information on air pollution levels. There will also be subsidy for restaurants to encourage them to move from using coal to electricity or gas-based tandoors. An allocation of Rs 6,729 crore, which is 12 per cent of the total budget, has been made for the health sector, and the launch of a ‘health insurance for all’ scheme was announced in the budget. An amount of Rs 100 crore has been allocated for the ‘health insurance for all’ scheme. First response vehicle will also be launched from East Delhi with 16 bike ambulances Sisodia said, adding Rs 403 crore will be allocated for setting up ‘mohalla’ and poly clinics in the national capital. On Wednesday, while tabling the first outcome budget 2017-18, he had said that the Delhi government has managed to set up 160 mohalla clinics till December 31 this fiscal, against a target of 1,000 such facilities. For the education sector, the government has allocated Rs 13,9997 crore, which is 26 per cent of the total budget. In the budget for the financial year 2017-2018, 23.5 per cent of the total budget amount was allocated for the education sector. Installation of CCTV cameras in school buildings, self-defence training for girl students, promotion of sports in schools and setting up of a world-class skill centre are among the big-ticket promises made by the AAP government in Thursday’s budget proposal. Sisodia said Rs 175 crore will be allocated for installation of CCTV cameras in school buildings. A total of 1.2 lakh cameras will be installed. “The government has allocated Rs 10 crore for self-defence training of girl students in Delhi and Rs 20 crore has been allocated for promotion of sports in schools,” he said, and also announced allocation of Rs 315 crore for setting up a world-class skill centre in the national capital to train the youth in getting jobs.